That Crazy Rich Asians is being adapted for the big screen shouldn't be a big deal, the same way a film like Love, Simon shouldn't have. But there has been a severe lacking of representation for Asian-Americans in Hollywood for far too long. It's like there are more white-washing scandals per year than American movies with Asian casts. Well that changes now, and it actually looks like a lot of fun. 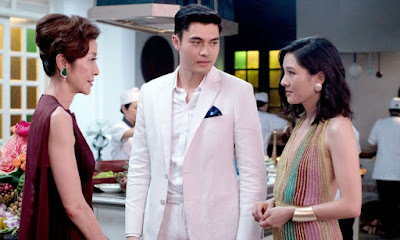 Directed by Jon M. Chu (Jem and the Holograms) and featuring an all Asian cast, Crazy Rich Asians is based on the novel by Kevin Kwan about Rachel Chu (played by Fresh Off The Boat's Constance Wu), a Chinese American who joins her boyfriend Nick (Henry Golding) to his home country of Singapore for a friend's wedding. Little does she know that Nick is not only filthy rich but one of Asia's most eligible bachelors, drawing the attention of the press and Nick's family. While this wouldn't normally be my cup of tea, it kinda looks like the Asian version of The Prince And Me, I'm won over by the interactions between Wu and the always-great Michelle Yeoh. Others in the cast include Ken Jeong, Jimmy O. Yang, Awkwafina, Gemma Chan, and Harry Shum Jr. Here's the synopsis: The story follows native New Yorker Rachel Chu (Wu) as she accompanies her longtime boyfriend, Nick Young (Golding), to his best friend’s wedding in Singapore. Excited about visiting Asia for the first time but nervous about meeting Nick’s family, Rachel is unprepared to learn that Nick has neglected to mention a few key details about his life. It turns out that he is not only the scion of one of the country’s wealthiest families but also one of its most sought-after bachelors. Being on Nick’s arm puts a target on Rachel’s back, with jealous socialites and, worse, Nick’s own disapproving mother (Yeoh) taking aim. And it soon becomes clear that while money can’t buy love, it can definitely complicate things. Crazy Rich Asians opens August 17th.